The very picturesque Seychelles Islands can readily be described as truly unique in the world. Lying some 1,600 kilometers off the east coast of Africa in the Indian Ocean, the archipelago is made up of 115 islands. They have been isolated since first rising out of the ocean that surrounds them and are the oldest mid-ocean islands in the world. Many species of flora and fauna are found only on the islands. The Seychelles, which became an independent republic in 1976, were first settled and named by the French in the late 1700s, and later governed by the British. The population of a little over 80,000 has a most diverse ethnicity including Europeans, Chinese, Indians and freed slaves, resulting in 3 official languages: English, French and Creole. Our arrival point was the International Airport on the main island, Mahe. Customs officials were efficient and friendly and in a short time we were on a small plane headed for Praslin Island some 15 very scenic minutes away. 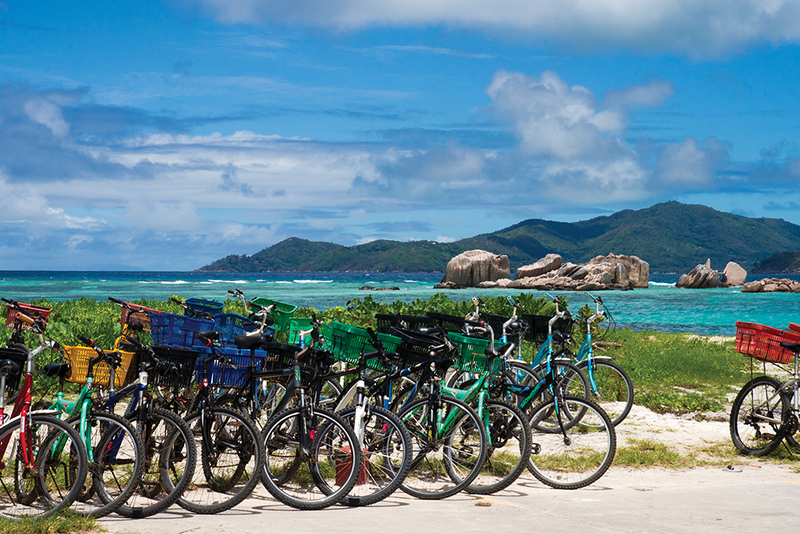 Mahe, Praslin and La Digue islands are home to almost the entire population as well as most of the tourist industry which dominates the economy. Praslin is best known for its Vallee de Mai, a World Heritage Site, which is the heart of the Praslin National Park, home to the coco de mer and described by some as being the original Garden of Eden. Our home during our stay on the island was the Constance Lémuria Resort and Spa. This 5-star resort has excellent amenities including 3 fine restaurants, a spa, and the only 18-hole championship golf course in the islands. This being the Seychelles, the course covers 3 gorgeous beaches including Anse Georgette. Plus it is the only resort to have a full-time turtle manager to watch over the returning females as they lay their eggs. Accommodations are most comfortable and the service excellent. A tour of the nearby Praslin National Park is well worth the effort. Some 40% of the land mass of the Seychelles has been preserved as national park to protect the unique vegetation inherent to the islands. This park is forested by palms including the coco de mer found only in the Seychelles. The palm has a number of unique characteristics including the largest fruit in the world, the largest seed and the largest female flowers. Male flowers are found on separate trees. The fruit takes a surprising 6 to 7 years to ripen and then a further 2 years to germinate. The palms reach 30 metres. The canopy these palms provide makes for a very comfortable stroll through the park. 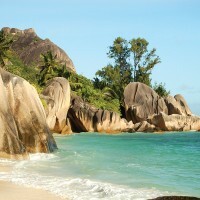 Nearby is Anse Lazio described by many as one of the most beautiful beaches in the world. I must say during our time in the Seychelles we saw an abundance of gorgeous beaches providing clear water, excellent snorkeling and lovely white sand. Choosing one over another would be a real conundrum. 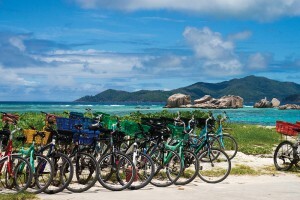 The island of La Digue, fourth largest and third most populated, is but 15 minutes away by ferry. This is a very laid back island with the principal mode of transportation being the bicycle or oxcart. Although there are some taxis, the intention in the near term is to replace them with electric cars. Central to the island is the historic L’ Union Estate with plantations that cover a third of the island. At one time the principal crop was copra made from dried coconut, and the oil derived from it. The old copra mill is still here, plus the remains of a vanilla plantation. Of course, nearby is another gorgeous beach, Anse Source d’Argent, apparently one of the most photographed beaches in the world with a fabulous granite rock formation, more white sand and clear water. From La Digue we returned to Praslin to board a flight back to Mahe. The vast majority of the population lives here on what is the largest island. The city of Victoria is one of the world’s smallest capital cities. Wandering around town is easy with numerous historic buildings to see and very friendly people. One restaurant we tried was Le Grand Trianon Marie-Antoinette. The restaurant is in a more than a century-old colonial mansion with Creole architecture that was originally a convent and is now a national monument. Featuring Creole cooking, the menu bears the same pricing as when it opened in 1972. La Plaine St. Andre is a short drive from Victoria. The restored plantation house dates from 1792 and is now home to a fine restaurant. This is also where Takamaka Bay rum is distilled. Well worth a tour to learn how they make a variety of different rums including a couple incorporating local spices. A little further on is Jardin du Roi, originally established by Pierre Poivre in 1771. He was a French administrator who introduced spices such as cinnamon, nutmeg, vanilla, pepper and cloves to the islands as an agricultural crop at the time when The Dutch East Indies had a virtual monopoly. For some time the spices were a mainstay of the islands’ economy. Today this working plantation continues to nurture a variety of aromatic spices, tropical fruits and endemic palms. Plus there is a small Creole restaurant which utilizes its own fresh produce. We certainly enjoyed our stay at Ste. Anne Resort and Spa, likely one of the finest resorts in the Seychelles. The property is on a 220 hectare private island, surrounded by the largest marine park in the Indian Ocean and just a 15 minute boat ride from Mahe. There are fewer than 100 hundred private villas; many, such as ours, with a pool in a private walled backyard. Of course, there are numerous gorgeous beaches as well. Plus the island is covered in natural vegetation making for a very pleasant environment. With 5 restaurants all serving great food, it’s pretty hard not to feel pampered in this gorgeous property boasting excellent service. The Four Seasons has a resort property about 30 minutes from Victoria. It sits on a secluded 170 acres with the resort itself positioned on a forested incline that descends to another gorgeous beach, Petite Anse. The 67 tree house villas are perched on stilts in a jungle of coconut, mango, jackfruit and cinnamon trees. The property comes with all the amenities one would expect of the Four Seasons including, of course, a superb spa. This property is an excellent haven in which to spend some time in an idyllic setting well removed from everyday concerns, while being pampered with a level of service that the Four Seasons is known for around the world. Le Meridien Fisherman’s Cove property, dating back to 1943, was the first luxury hotel in the Seychelles. The contemporary 68 rooms and suites sit on the mandatory gorgeous beach on the western tip of Beau Vallon Bay. Again, the property has the amenities and setting to ensure complete relaxation. The Seychelles are truly a tourist’s delight. The terms ‘gorgeous’ and ‘idyllic’ constantly return to describe a setting that has a reputation as a ‘must experience’ destination, combining natural pristine beauty and a population which enjoys a high standard of living. Every effort is being made to retain the natural environment to ensure the inherent beauty. Time spent in the Seychelles is guaranteed to be unhurried. The memories will be of white sand, clear blue water, unique flora and wildlife in a protected environment; complemented with Creole cuisine and culture. From Vancouver, the Seychelles are about as far away as you can get before starting to return around the other side of the planet. To get there we chose South African Airlines. The airline is the most awarded airline in Africa and its business class enjoys a 4-Star ranking with Skytrax. Plus with being a member of Star Alliance and code sharing with Air Canada, connections are fine. Our experience with South African Airlines has always been most pleasant which is highly desirable for that length of flight. The Johannesburg airport was completely updated for the World Cup and is likely now one of the better airports in the world. Air Seychelles offers service from the airport and their business class we found to be good. Considering the distance we had come, spending a few days in Johannesburg only made sense. The Westcliff Hotel is likely the best property in the city. Originally meant to be a real estate development, the property is set on a cliff side in a garden estate providing a very relaxed setting for a big city hotel. The rooms are spacious and well-appointed. Service and amenities are everything you would expect from a 5-star property. Johannesburg, as a result of the recent history of South Africa, has a mixed reputation so we entrusted ourselves to our favourite tour group, Abercrombie and Kent. The infrastructure of the city was completely updated, again for the World Cup. Our driver/guide was very proud of how the country has changed and grown. But he did mention that one expressway bridge was completed just 5 days before the start of the event and so it was with some trepidation he first used it when opened. The Apartheid Museum is well worth a visit. It’s amazing that Nelson Mandela was so conciliatory and not vengeful after the conditions he endured in his extended imprisonment. We were encouraged to visit Soweto—which I did with some trepidation based on media reports of conditions and killings through the years. Again our guide was extraordinarily proud to show us the most populous black urban residential area in South Africa, boasting it was the only community in the world to have two Nobel Prize winners living on the same street; Nelson Mandela and Desmond Tutu. The community reflects the dramatic transition going on in South Africa. There are still people living in corrugated steel huts with minimal services. But they are alongside large brick luxury homes with BMWs and Mercedes Benzes sitting out front. Across the street from one of the largest modern shopping centres in the country, entrepreneurs can be found who typify the spirit of the community. They had set up a small barber shop housed in a canvas shelter and powered their hair clippers with a car battery. We actually had lunch in a very nice restaurant on the same street where the Nobel Prize winners live. Johannesburg is well worth a visit.